Add more drilling blocks to your order. When the drill is press down, it ends at the wood block, ensuring all pages are drilled through. These blocks will need to be replaced from time to time as they get worn out, so having extras on hand makes a lot of sense. If you need to punch several projects in the same position, then add side guides to the machine so you can consistently get the same alignment. The Challenge Handy-Drill is a cost effective single spindle paper drill designed for use in small and medium sized print shops, binderies and offices. This paper drill offers a 2-1/2" lift capacity and can be used with four different bit sizes (1/4", 5/16", 3/8" and 1/2"). The Handy drill is easy to operate; All you need to do is pull down the handle and the spindle motor automatically turns on. Plus, the Handy-Drill even comes with an adjustable backguage to allow you to dill multiple hole patterns. Check out other details and specifications below. Conveniently located chip collector cups - Located around the spindle, they include a sight gauge to signify when the cups are full and need to be emptied. The cups also serve as safety covers with interlock switches. When removed to change the drill bit or to empty the paper chips, power to the motor is locked out until the cups are replaced. Adjustable Margins: Thumb screws easily lock the backguage to the drill table. To adjust the margins, simply loosen the screws and line-up the gauge with the dual scales located on the drill table. Hole locations can be drilled up to 2.5" margin from the edge of the paper. We had a really old Challenge drill. This one makes the process much easier and safer. The auto off and catch tray advances are appreciated. Fits easily on our counter and is really easy to use. Drills through paper like nothing. Just need to be sure that you don't go too fast. We also bought a bit sharpener and some drill wax to go with it. Would definitely recommend this if you need a decent table top paper drill. Welcome to MyBinding video. 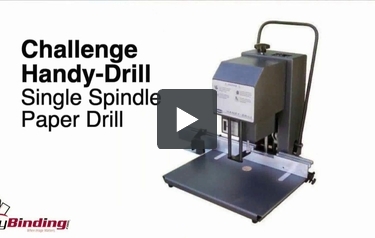 This is the Handy-Drill, a single spindle paper drill by Challenge. If you’re tired of the price and inconvenience of outsourcing paper drilling or you’re looking to be creative and you need new holes, new sizes and new locations, a paper drill might be your best answer. The Challenge Handy-Drill could be a great start, great replacement or great second machine. It comes with a built in large work table at 18” x 19” and has plenty of measuring tools so your drilling is precise. The challenge handy drill has 2 ½” lift capacity with plenty of sizes in the 2” and 2 ½” drill bits. Here at MyBinding we’re committed to you as a customer for the long haul so we have all of these supplies that you may need down the road to expand or replace. This machine is built with simplicity and ease in mind and a single knob at the top allows you to make minor adjustments to the height of your drill bit from the floor of the machine. Very convenient screw on the front allows you to remove the chip trays right there in front and access drill bit for easy removal, replacement and sharpening. Blade sharpening and bit clearing is very important in the process of paper drilling. We’ve also created an entire video for this machine on how to care for and make adjustments to it. In terms of precision of drilling, there are four customizable adjustable backgauge stops. You simply measure where you want your holes to be and screw them down tight. The entire backgauge is like a fence that slides forward and backward for full depth of margin control. When you purchase the Handy-Drill, everything is in the box that you need to get going. ¼” and 5/16” hollow drill bits, two wood drilling blocks, trip backgauge, manual and a tool kit for adjustments and maintenance. Safety was thought off in building this machine. There’s an auto shut-off built right into the lever and it keeps hands clear of the work space. Here at MyBinding we are serious about our customer service. If you have any questions at all, just give us a call and we can walk you through this machine or another and find exactly what it is that you need. That’s the Challenge Handy-Drill. Happy drilling. For more demos, reviews and how-to’s, check out MyBinding.com. Welcome to MyBinding video. So you’ve got the Challenge Handy-Drill and you have a few questions on maintenance. You’re in luck, this video is here to help you understand how to adjust and care for your Challenge Handy-Drill. Let’s begin with the wood drilling blocks. First of all, we hope that you’re using a chip board just above that wooden block. The goal is to actually never to make contact with the block and just a little bit into the chip board below your paper stack. However, eventually everyone goes through it at some point and the wood block is damaged. You can start by flipping the block over and also purchasing extra replacement blocks. Make sure you get the right size for your machine. You need to be completely flushed with the worktable. Again, set your drill height so that makes just contact with the chip board. All the punched chips will pop out into the small containers right above the drill bit. Loosening the knob right in the front of the machine between the two spiral spindles you can remove either or both sides of the box. Removing the front box also gives you access to the drill bit itself. With the tool provided and the lower hole, insert the tool and simply pop out the drill bit. You’re now free to make sure that drill bit is completely clear. Here at MyBinding we do sell a drill bit clearer and it’s useful for most sizes and it is really important that you keep the drill bit clear. Those chips can gather up, compact and do damage. And should you purchase our drill bit clearer, you could do it by hand or even with the machine itself, you could simply lower the lever down and clear it that way. The Challenge Handy-Drill uses hollow drill bits. Here at MyBinding we carry quite a number of options to meet your needs. We carry standard, coated and premium drill bits in various sizes. As you well know, the cutting or drilling of paper dulls blades fast. It’s crucial that you keep your blades nice and sharp. There are at least two ways to do this. One is with a hand sharpening drill or a simple machine known as a drill bit sharpener. In goes the drill bit on one side, it holds it steady while the driller on the other side simply twists the knob, sharpening things up. This way is certainly more precise and easier with multiple spindles. If you haven’t learned by now, make sure that both sides of the boxes are on and that knob is good and tight, otherwise not everything works. It’s part of its safety shutoff feature. Your paper drill is a machine doing a lot of hard work. You’ll want to keep it lubricated. Drill-Ease is a wax style drill lubricant that’s shaped kind of like a large chopstick. With the drill on, simply hold it just to the bottom and let it spin its way to ultra smoothness. And finally, if your Trip Backgauge is getting a little wiggly, you just need to maintain it by using the tools provided and screw down those bolts. There you go. If you have any questions at all, give us a call. Happy drilling. For more demos, reviews and how-to’s, check out MyBinding.com. If you need to put holes in large amounts of paper and that trusty old hole punch isn't cutting it anymore, you need to get a paper drill. One that's worth considering is the Challenge Handy-Drill. This is a device that's safe to use and it can process up to 2.5 inches of paper at a time. Take a look at its strengths and weaknesses to see if it's right for you. The Handy-Drill has the ability to put holes in 2.5 inches of paper. A typical 500-sheet ream is about 2 inches tall, so you'll be able to process hundreds of sheets at a time. Using this device will make it easy to process your paper very quickly. This machine can handle drill bits of four different sizes: 1/4", 5/16", 3/8", and 1/2". If you decide to only drill through 2 inches of paper you can use bits ranging in size from 1/8" to 1/2". This gives you a lot of flexibility. One of the great things about the Handy-Drill is that it offers safe operation. The machine kicks on automatically when you pull the handle down and will shut off as soon as the spindle reverts to the "up" position. Also, the motor receives no power when the chip cup is removed. Both of these features greatly reduce the likelihood of an accident. The Handy-Drill's backgauge has adjustable stops so you can produce multiple hole patterns. When you're done drilling one hole, just adjust the backgauge and then you can drill again. The margins can also be adjusted so you can control where exactly your sheets are punched. This machine comes with a one-year warranty so you can have peace of mind. Since this is a single spindle device, you'll probably find that it takes a while to put multiple holes in your stack of paper. That's because the machine can only drill one hole at a time. If you anticipate needing to produce sheets with multiple holes, you should get a machine with more than one spindle. The Handy-Drill is slightly larger than the other compact drills on the market. Its approximate dimensions are 22" (height) x 24" (width) x 21" (length). It's also a bit heavier, weighing in at 70 pounds. The Challenge Handy-Drill has a lot of great features and it would be a good choice if you're shopping for a single spindle drill. This machine has a fantastic drilling capacity and it will really help you process your paper quickly so long as your sheets don't require multiple holes. It's great that this device is compatible with drills of different sizes and that it's safe to use. (You should still use caution when operating it though, just to be safe.) Also, the fact that you can adjust the margins and backgauge will make it possible for you to put holes exactly where you need them. Since the Handy-Drill has so much to offer, you should really consider taking a look at it. We recently sharpened the drill bit and now pretty much every time we use the drill the bit is getting jammed in what ever we are drilling causing damage to the project. Only way we have been able to remove the papers are a few pages at a time. To address technical issues the best first step is to contact the manufacturers technical support department. The manufacturer is Challenge and their phone number is (231) 799-8484 .